The supply of gasoline is still questionable in many states in the Southeast, including in Georgia, North Carolina, South Carolina and Florida. Places where gas is still available, prices are very high, ranging from the low $3 per gallon range to the high $3 and even up to as high as $4. The government has announced that fuel supplies will continue to flow to those states, but some stations may run out and stay out of gas for a couple of days. The NASCAR Southeast Series was the first to announce that their race this weekend at Myrtle Beach Speedway would be canceled for the fear of the gas crisis. High gas lines and a fear of a gas shortage forced several racing series to cancel their races. While pale in comparison to all of the events going on in Louisiana, Mississippi and Alabama following Hurricane Katrina and its aftermath, the storm and its effects on the entire Southeastern part of the country are taking a toll of the racing world. Obviously, racetracks that were located in the path of the hurricane will be down for quite some time, and well understood, as racing in that part of the country is one of the least important things right now. However, racing at other tracks around the Southeast are also felling the effects of Katrina, many because of the current gas crisis that is gripping the Southeastern part of the country. Myrtle Beach will still run their weekly show for its local fans. “I want to send all of my wishes and prayers to all of those that were affected by the hurricane,” said Southeast Series driver Jason Hogan, who lives just outside Atlanta, Georgia. “It is a horrible time in our country and we need to all do whatever we can to help those people. 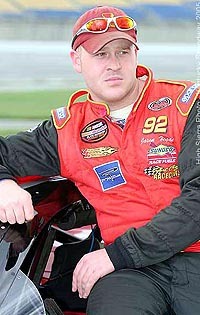 “I think that is was the right call for NASCAR to cancel the race at Myrtle Beach. With the current situation of gas and the issues of some places being out and other places not, but running low, it just it better for the drivers, teams and fans. There wouldn’t have been that many fans that would have been able to travel to the event from anywhere other than the Myrtle Beach area. 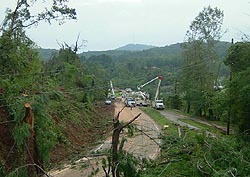 The storm’s far reaching effects came a little too close for comfort to Hogan when a tornado from the outer bands of the storm touched down on Monday in Helen, GA, just miles from Hogan’s home. Later on Thursday, Five Flags Speedway canceled their Friday night Blizzard Series event for Super Late Models for the same reason after planning to run the show for several days and collect money for the Red Cross. Montgomery Motor Speedway canceled Saturday’s running of the BAMA Super Series early in the week after Katrina came ashore and well before the unrest that followed in the storm’s aftermath. The effect was far reaching too. The O'Reilly Southern All Star Late Model Dirt Series events that were schedule for Friday & Saturday night at the Thunder Valley Speedway in Lawndale, NC., and Lancaster Speedway in Lancaster, SC., were canceled due to the problem with gasoline and diesel fuel availability in and around the area of north Georgia, North and South Carolina. The Friday night Thunder Valley event will be made up on Friday night October 21st, and the following night October 22nd the series will make up the race at the Lancaster Speedway. The effects were also felt with local tracks running local shows. Tri-County Speedway in Murphy, North Carolina postponed their season finale until Saturday September 17. "With all the problems created by hurricane Katrina, we have decided to postpone the season finale until Saturday night September 17," said promoter Phil Evans. "We are going to wait and see how things progress and try again in two weeks." Several local tracks were in the path of the Hurricane. According to Panhandleracing.com, several tracks were affected. “Deep South Speedway at Loxley AL will not be open,” the site posted. “While the track escaped severe damage may of their drivers and fans in the Mobile and Sout Mississippi areas did not fare so well. The Loxley AL speedway may resume racing next weekend. Blackman Motor Speedway in Blackman FL cited fuel availability as one reason the speedway will not be racing on Friday night..
A tornado touched down just miles from Hogan's home in Georgia. As Speed51.com reported on Wednesday, Mobile Speedway suffered significant damage as well. Debris from the front gate archway littered the parking lot upon first look. As Fields ventured further towards the track, it was apparent that there would be no racing in Irvington, Alabama for a long while. Other damage to the speedway included water and roof damage to the main scoring tower, missing roofs on other various buildings on the property, downed power lines, missing billboards and more. Electrical damage has not been determined because there is no power to the area and may not be for at least a week or more. Many refugees from Louisiana are being shipped to San Antonio, Texas. There, San Antonio Speedway General Manager and USRA owner Terry Dickerson said that refugees from Louisiana and Mississippi will be admitted free to the monster truck and stock car racing program this Saturday at the speedway. “It’s the least we can do to show our support for these folks who have been through so much,” Dickerson said. “All they have to do is show up at the track with a valid Louisiana or Mississippi drivers license at the front gate and they will be our guests for the evening. There is no word on when the SES, BAMA or Blizzared races will be made up as of yet. Speed51.com encourages fans to continue to support the relief efforts of Hurricane Katrina. We also send out support and prayers to all of those affected. If you’d like to contribute to the relief efforts, please visit RedCross.org or make donations at your local track. 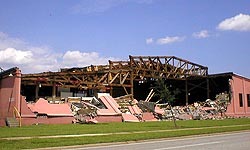 The Mobile, AL area suffered damage, like shown here to the town's airport.